Nowadays it feels like everything in our homes is connected to the internet, from our kettles to our TV's, but one area of smart technology that is flourishing is smart security, and particularly smart locks. Smart locks have come a long way in both technology and design. The best smart locks on the market are not only super effective, but they also look like designer pieces that lend a touch of style to your front door. From August to Kwikset to Yale, there are a wide variety of smart lock input methods and designs, from touchscreens that do away with the keyway entirely to those that you won't even know are smart locks from the outside. The key is to find which smart lock works well for you, your door, and your home. We've put together this guide to the best smart locks on the market and unlike these products, you don't need a special code to access our expert advise on which lock is right for you. The Nest x Yale lock integrates with your Nest smart home products, so this device extends well beyond your front door. It's an all-round excellent smart lock, though mainly if your home is decked out in other Nest devices. Setup is often a sticking point when it comes to smart locks, but the Nest x Yale lock is easy to install and connect to your internet (if you spring for Nest Connect, that is). The lock features a keypad on the outside, so you punch in a code to enter your house, rather than insert a key. This is great if you keys are shoved way down in your pockets or purse. One neat feature is one-touch locking, which allows you to lock your door just by pressing the Yale logo. To unlock with the same method, you press the logo again, then follow a few more steps before your door is opened to you. There's also the option to have the Nest x Yale lock at a pre-set time, especially helpful if you often forget to lock your door at night. The Next x Yale lock is available in Satin Nickel, Oil Rubbed Bronze and Polished Brass, so no matter what your style is, you should find something that fits. The Schalge Sense is another easy to install and use smart lock, though its size runs a bit on the bulky side. You can lock and unlock your doors straight from the app, or by entering codes on the keypad. There's a deadbolt on the inside portion of the lock for when you want to lock the door from inside your home. Using the app, you can create and delete codes, convenient if you want to generate codes for house guests. However, to use this feature, you will need to do so over Wi-Fi or via the lock's built-in Bluetooth. In our own testing, we used the app to lock our front door at night, after we'd already gotten into bed and under the covers. The app leaves something to be desired, and you'll need patience to deal with dropped connections from time to time. The Schlage Sense works with Apple's HomeKit, so you can control your lock using devices like an Apple TV, iPad or HomePod speaker through the HomeKit app. The lock also supports Google Assistant and Amazon Alexa, allowing you to use just your voice to unlock and lock the device. The August Smart Lock Pro is one of the best looking smart locks on the market, though from the outside, you would never know it's there. That's because your deadbolt looks exactly the same on the exterior (in fact, it's the same one you've always had), while the August Smart Lock Pro puck sits on the inside. This makes for a discreet lock that still lets you use your existing keys, if you so choose. Using the August app, you can see whether your door is closed and locked. If you've left the house and are approaching it again, the device will automatically unlock when you're 20-30 feet from your door, granting you easy, keyless access. Conversely, the lock will automatically bolt into place if you leave the house in a rush, and you can check that your door is secure using your smartphone. You can also send keyless codes to visitors or anyone who is dropping by your home on a regular basis, and track who is coming in and out of your door. Finally, you can control the August Smart Lock Pro with the voice assistant of your choice: Siri, Alexa or Google Assistant. 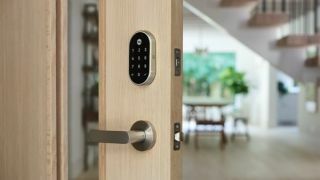 You will need a Wi-Fi bridge in order to unlock the full potential of the August Smart Lock Pro, and a device called the Connect is included when you purchase the lock. The Kwikset Obsidian is a great-looking smart lock. It hugs tight against the door for a low profile, and has a glassy sheen that adds a touch of elegance to any door. It's completely keyless, with only a touchscreen for entering access codes. You can create up to 16 logins for family and friends. The lock also includes a patented Kwikset safety feature called SecureScreen that basically prevents someone from seeing where you've touched the screen to input your code (it generates random digits that you have to press before entering your actual entry code). This is to prevent someone from simply looking at where your fingerprint smudges are and copying the code that way. The Kwikset Obsidian stands out from the smart lock crowd in more ways than one. Should I buy a Quikset Obsidian Smart Lock?